Running during May and June this year, the annual City of Ale Festival in Norwich was a celebration of real ale from local breweries in real ale pubs and other venues, with a total of over 42 pubs showcasing over 227 different types of ale. 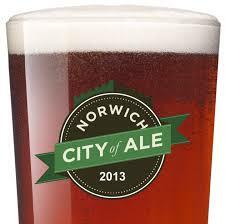 As a proud supporter of the City of Ale for the past three years, Signs Express (Norwich) ensured that the publicity for the festival was prominently displayed across the city, by providing all of the exterior banners and the large format graphics for the vintage 1954 Bristol double-decker red bus, on its many journeys around Norwich. As a highly effective promotional medium, signage is essential to all businesses. Whether you use signs to attract or inform customers, reinforce your corporate identity or to comply with health and safety regulations, Signs Express (Norwich) has the skills and expertise to fulfill every need. Signs Express (Norwich) provide a complete design, manufacture and fitting service for all forms of signage including interior and exterior signs, vehicle graphics, window graphics, banners and exhibition products. Whatever your idea or design our skilled sign makers can manufacture and fit the signage to suit your brief exactly, on time and within budget. PPS goes back to school!